In line with this month’s Challenge150 daily gratitude challenge, here are 4 tips on how to gratitude journal effectively to see a positive boost in your mood. 1- First off, why is gratitude journaling good for you? As a counsellor and therapist, there’s many reasons why I would encourage clients to journal and more specifically, gratitude journal – it allows to balance out the picture or movie you keep replaying in your mind. For a few moments, you get to flip the coin from negativity to positivity. It encourages your mind to see things from a different perspective which can also be a great exercice for developing useful problem-solving skills. This mindfulness-based practice is centered on cognitive re-framing which consists of challenging our negative thoughts or distorted beliefs by finding the evidence to challenge or disprove those thoughts and finding new alternative thoughts, that can either be neutral or positive. Although gratitude journaling might not “cure” you from your depressive or anxious symptoms, it could force and train your brain, for a few minutes every day, to see things from a different point of view or just provide a little relief from the non-stop chatter of negative thoughts. Trust me, we’ve all been there… it’s easy to get stuck. 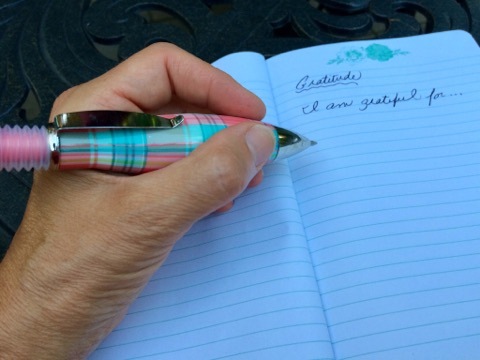 So, in good old plain english, why is gratitude journalling good for you? It’ll make you feel better… even if for only a few moments. You’ll train your brain to see a more balanced view of the world (and yourself!) with both the good and the bad. AND it can give your mood that positivity boost as you’ll see in some of these studies. 2- How can I gratitude journal effectively? Books, studies and articles vary in their recommendations from 1-2 times per week to every single day… best to do what works for you and stick to it. Another tip is to change it up so you constantly challenge your brain by finding gratitude in something new or different every time! If you want to learn a little more about that, this article by Greater Good is short and sweet and filled with helpful tips around regular gratitude journaling. 3- When should I practice gratitude? Are we allowed to say… always?! If you’re talking specifically about journaling, it might be easier to schedule that time at the end of your day. Or, find a time in the day where you could use a boost of positivity – after lunch maybe? Before a big group presentation? While doing a boring chore at home? Again, do what feels right to you. 4- What can I be grateful for? That’s a tough one! Sometimes I feel like saying… EVERYTHING! You can be grateful for everything! Yet, that’s not really true. Perhaps a more appropriate answer should be: something and anything… I remember a colleague of mine who lost her mother tragically and suddenly from a stroke and she was there through the whole ordeal. She told me that after the ambulance ride and the hospital stay where her mother was officially pronounced dead, she went home and found things to be grateful for about that day. I couldn’t believe it! Looking back on it, I realize that this practice brought her some comfort in a moment of great unpredictability and grief… she somehow found gratitude not only in other parts of her day but also for the loving & caring relationship with her mother she cherished very much. Don’t get me wrong, she still had to do months and years of trauma therapy but the way she remembers that day doesn’t seem as dark & hopeless as it could have been. You can also read our blog post on grief: Beauty in the Face of Loss to get a new and different insight into losing a loved one. All in all, as you move along in your gratitude practice, it’ll be important to challenge yourself by finding gratitude in different moments of your life… creating a little more comfort in those moments of great emotional discomfort or distress. I will always admire my colleague for her courage in that story and I hope that it will bring you the same kind of hope and gratitude as it did for me. To finish off, I’d like to say thank you to… you. Yes, you. I am so grateful that you are here on this earth bringing your own tint of colour and pazzaz that is so important to a balanced world. As always, good luck on your journey to health and balance and feel free to email or message us directly with any comments or questions.